This article is about tubes producing visible discharges or used for switching purposes. For the use of gas-filled tubes for radiation detection, see Gaseous ionisation detectors. A gas-filled tube, also known as a discharge tube, is an arrangement of electrodes in a gas within an insulating, temperature-resistant envelope. Gas-filled tubes exploit phenomena related to electric discharge in gases, and operate by ionizing the gas with an applied voltage sufficient to cause electrical conduction by the underlying phenomena of the Townsend discharge. 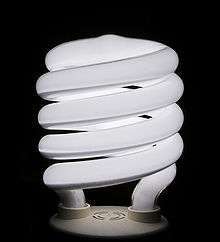 A gas-discharge lamp is an electric light using a gas-filled tube; these include fluorescent lamps, metal-halide lamps sodium-vapor lamps and neon lights. Specialized gas-filled tubes such as krytrons, thyratrons, and ignitrons are used as switching devices in electronics. Xenon in pure state has high breakdown voltage, making it useful in higher-voltage switching tubes. Xenon is also used as a component of gas mixtures when production of ultraviolet radiation is required, e.g. in plasma displays, usually to excite a phosphor. The wavelength produced is longer than with argon and krypton and penetrates the phosphors better. To lower the ionization voltage, neon-xenon or helium-xenon are used; above 350 torr, helium has lower breakdown voltage than neon and vice versa. 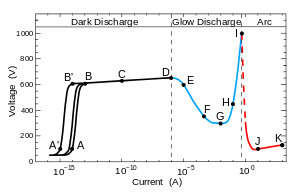 At concentrations of 1% and less of xenon, the Penning effect becomes significant in such mixtures, as most of xenon ionization occurs by collision with excited atoms of the other noble gas; at more than few percents of xenon, the discharge ionizes xenon directly due to most energy of the electrons being spent on direct ionization of xenon. Voltage-current characteristics of electrical discharge in neon at 1 torr, with two planar electrodes separated by 50 cm. The gas in the tube has to be kept pure to maintain the desired properties; even small amount of impurities can dramatically change the tube values; presence of non-inert gases generally increases the breakdown and burning voltages. The presence of impurities can be observed by changes in the glow color of the gas. Air leaking into the tube introduces oxygen, which is highly electronegative and inhibits the production of electron avalanches. This makes the discharge look pale, milky, or reddish. Traces of mercury vapors glow bluish, obscuring the original gas color. Magnesium vapor colors the discharge green. To prevent outgassing of the tube components during operation, a bake-out is required before filling with gas and sealing. Thorough degassing is required for high-quality tubes; even as little as 10−8 torr of oxygen is sufficient for covering the electrodes with monomolecular oxide layer in few hours. Non-inert gases can be removed by suitable getters. for mercury-containing tubes, getters that do not form amalgams with mercury (e.g. zirconium, but not barium) have to be used. Cathode sputtering may be used intentionally for gettering non-inert gases; some reference tubes use molybdenum cathodes for this purpose. 1 2 3 C. A. Pirrie and H. Menown "The Evolution of the Hydrogen Thyratron", Marconi Applied Technologies Ltd, Chelmsford, U.K.
1 2 "Pulse Power Switching Devices – An Overview"
1 2 3 4 "The Fluorescent Lamp – Gas Fillings". Lamptech.co.uk. Retrieved on 2011-05-17. ↑ Thyratron various. Cdvandt.org. Retrieved on 2011-05-17. ↑ "Sylvania: 6D4 Miniature triode thyratron data sheet" (PDF). Retrieved 25 May 2013.